Left: Randomly downed corn discovered July 5, 2004, in Hillsboro, Ohio garden. Photograph © 2004 by owners. 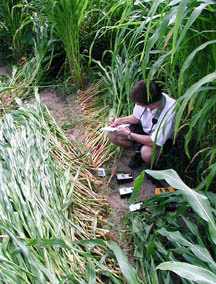 Right: Discovered July 13, 2004, more of a rectangle of downed corn about 40 feet long by 30 feet wide in Martha Bailey’s garden, New Milford, Connecticut. Photograph © 2004 by David W. Harple, The New-Times. 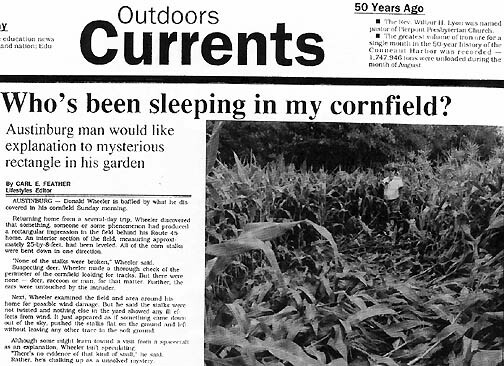 New Milford is about twenty miles west of Waterbury, Connecticut.July 15, 2004 New Milford, Connecticut – Yesterday, Kamilla Gary reported in The News-Times of Danbury and New Milford, Connecticut, about “Mystery of the maize: New Milford woman’s corn crop flattened overnight. Mid-garden damage defies explanation, son says.”Today I talked with Kamilla and the corn crop’s owner, Martha Bailey, who has lived at her New Milford home for three years. 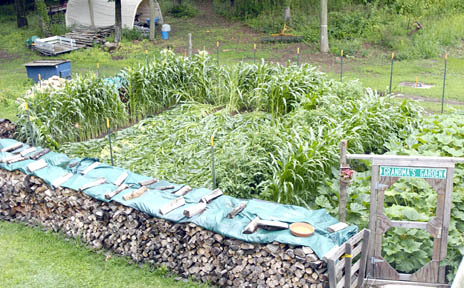 There is a 7-foot wire fence built around her garden of tomatoes, squash, yellow and white corn. The squash was about three feet high and the corn plants were nearly six feet high. But on Tuesday morning at 6 a.m., she had sat down to have coffee and was shocked when she looked out the window. Martha Bailey, Small Business Owner and Gardener, New Milford, Connecticut: “I looked out ­ ‘Where is my corn? !’ I see one row standing on the left side by a fence and some standing on the right side about 30 feet away and there is nothing in the middle. However, there is some on the back fence. I have a 7-foot fence all around my garden and this one rectangular section from the north to the south is just flattened as flat as a floor. Martha Bailey and her 7-year-old granddaughter, Shannon Bailey, lift up some of the corn flattened some time in the night of July 12 to 13, 2004. Photograph © 2004 by David W. Harple, The New-Times. Exactly, and all laid to the south. There was no wind. We did have rain the night before (July 12, 2004), but it was not a severe pounding rainstorm. SO THE GROUND WAS SOFT AND YOU SHOULD HAVE BEEN ABLE TO SEE TRACKS, RIGHT? There was nothing there. There were no holes amid the cornstalks. There were no burn marks on the corn stalks. My garden is secured by gates and a fence. And nothing ­ no vandalism, no children around my neighborhood. I have 3.5 acres. I have two very nice neighbors. That’s it. It didn’t hurt my tomato plants. I have 20 tomato plants. It didn’t hurt my squash. It just took out this small section of corn, like six rows 40 feet in length by 30 feet wide. DID THE POLICE OR SHERIFF COME OUT? Oh, no. I had no reason to call them. SOME PEOPLE WOULD SAY THAT WAS VANDALISM. It’s absolutely not in this neighborhood. I live on a country road and there are no small children in the area, no vandalism. I have a 4-foot wood pile in front of my garden with a green tarp on it. There are two green tarps and where the tarps meet each other, in the middle where the corn went down, the tarps were kind of turned upwards toward the south. So if the corn laid down from the north to the south, whatever did it had a force that separated the two pieces of tarp that are over my wood pile, which were before very flat. Four foot high stacked firewood covered with green plastic tarp that was “turned upwards toward the south” on Tuesday morning, July 13, as if it had been raised somehow. It had been flat. Photograph © 2004 by David W. Harple, The New-Times. AS YOU’VE HAD A CHANCE TO THINK ABOUT THIS SINCE TUESDAY, HAS ANYTHING STRUCK YOU AS HOW THIS COULD HAVE HAPPENED? No, because my daughter-in-law talked to Dr. Mel Goldstein on Channel 8 news in New Haven, Connecticut and he said there was absolutely no wind that night and we didn’t hear any wind. We did have rain, but it was not heavy torrential downpours. But the ironic thing about it is that the corn on the left side of the fence is still standing and then there is a row of corn on the north side that’s still standing. And some on the east side that is still standing. So something had to come like straight down and toward the south to knock these 7 or 8 rows of corn down. WHAT IS BEYOND YOUR PROPERTY TO THE NORTH? DO YOU KNOW IF THERE IS ANY HISTORY OR MYTHOLOGY ABOUT YOUR PROPERTY OR YOUR AREA LINKED TO ANCIENT BURIAL MOUNDS? Yes, there is. On Route 7 which is not far from here about a mile away, the Indians were here years ago. They just built a new New Milford High School and they found a lot of artifacts. Yes. We’re trying to clear 3.5 acres and we’ve done a lot of digging and haven’t found a single arrowhead or anything related to an Indian village. But Fort Hill Road, very close to me, and I think that’s where the Indians were. There’s a lot of water around here ­ not ponds or lakes, but like water runoff ­ and we have a lot of limestone on my property and I have a big galvanized water tank to the right of my garden where I get the drainage off my little garage which is on the east side of my property and it stops the wind from blowing west to east. My garage is there and my water tank and I water my garden with that. In the west, we have woods. And the wood pile is in the south and I have a 7-foot fence around the garden. THERE WAS NO BREAK IN THAT FENCE? WITH ALL THAT LIMESTONE, DO YOU HAVE A LOT OF UNDERGROUND WATER? I believe so. When I bought this house in 1999, we bought it from Sunny Valley Nature Preserve and when we dug the new well, it was just pure limestone coming up when they were drilling. ISN’T IT UNUSUAL WITH ALL THE OTHER PLANTS IN YOUR GARDEN THAT ONLY YOUR CORN WAS AFFECTED? 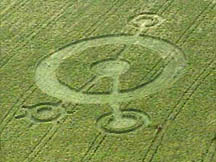 300-foot-long formation in wheat with additional 185-foot “tail” of small circles reported on June 17, 2004, in a wheat field southeast of Fairfield in Solano County, California, only four miles northwest of 2003 pattern. Aerial photograph © 2004 by Tharee Davis. Spanish Fork, Utah, formation in barley first noticed by farm owners on Saturday night, June 26, 2004. Large ring measured 25 feet east to west and 24.5 feet north to south, almost a perfect circle. Whole formation, including later added fourth “eyeball” measured 207 feet by 118 feet. Aerial photograph © 2004 by KSL-TV, Channel 5, Salt Lake City, Utah. 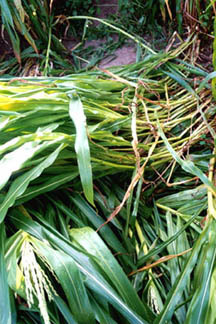 A dozen random patterns of downed oat plants were discovered on Saturday, July 3, 2004, by Eagle Grove, Iowa farmers. No weather explanation and no animal or human tracks.Video image © 2004 by KCCI The Iowa Channel 8. Randomly downed corn discovered July 5, 2004, in Hillsboro, Ohio garden. Photograph © 2004 by owners. Hillsboro Field Research by Jeffrey Wilson and Ted Robertson, ICCRA – Independent Crop Circle Researchers Assoc. The six Hillsboro, Ohio, corn photographs below are provided with text by Jeffrey Wilson, Director, ICCRA. 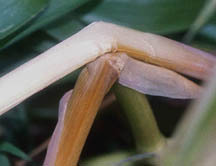 1) “Two stalks bent over, one on top of the other; the bending of the second stalk conforms to the bend of the first stalk. 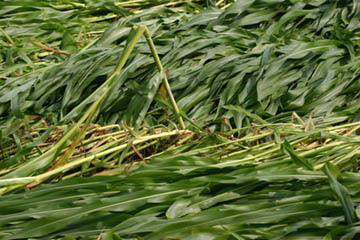 Bent stalks in Hillsboro, Ohio, downed corn. Photograph © 2004 by Jeffrey Wilson, ICCRA. 2) “This is a picture of Row 6 where the start of the flattening begins. You can see that stalks side-by-side are both standing and flattened! 3) “This photo was taken by the landowner at the time of discovery. You can see all the corn stalks flattened to the ground, however in this photo, a single stalk is bent over at about 18 inches from the ground. Corn flattened around one single stalk that was bent over about 18 inches above the ground. Photograph © 2004 by corn owners. 4) “This photo shows a section of corn rows 2 and 3 where the stalks are layered in five separate layers (in four different directions). Hillsboro, Ohio corn stalks laid down in five different layers in four different directions. Photograph © 2004 by Jeffrey Wilson. 5) “This is the aerial photo of the entire garden plot showing the direction of the lay to be generally SW to NE. 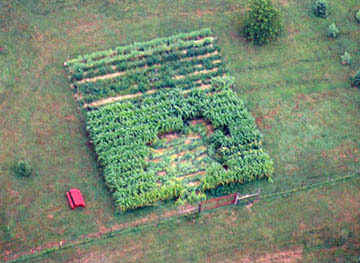 Aerial of Hillsboro, Ohio, small corn field in which Something unidentified laid down the plants generally in a southwest to northeast direction. Photograph provided by ICCRA. 6) “This is a photo of Row 6 looking East. You can see the change in the direction of the flattening of the corn stalks (some flattened south; some flattened north). I am in this photo with two TriField Natural ElectroMagnetic Field Detectors, one TriField Broadband EM Field Detector, a GammaScout Geiger Counter, a couple of GPS meters, and a digital weather instrument for measuring temperature and barometric pressure. I am taking notes.”Jeff told me that all of their measurements in the Hillsboro, Ohio, downed corn were anomalous when compared to measurements of normal control plants outside the downed corn. Row 6 looking east in which some corn flattened south and some flattened north. Jeff Wilson notes measurements from equipment. Photograph © 2004 by Ted Robertson. Elongated growth nodes in this downed barley described by an investigator for BLT, even though the consensus of residents is wind damage. Several oval downed areas in pasture grass reported July 10, 2004, by man in Chuckey, Tennessee, who wishes to remain anonymous. Photo provided by ICCRA. 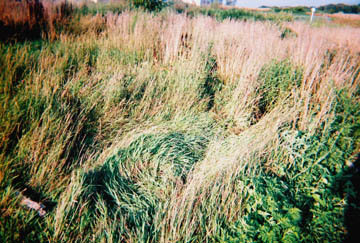 At least five ovals ranging from 10 feet to 20 feet long, swirled counter-clockwise in tall pasture grass. Man who discovered them told Jeffrey Wilson, Director, Independent Crop Circle Researchers Association (ICCRA), there are more downed areas and the field needs to be investigated further. The land is also in a region known for Cherokee Indian arrowheads. 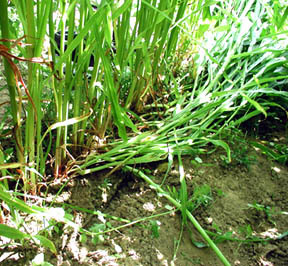 Discovered July 13, 2004, more of a rectangle of downed corn about 40 feet long by 30 feet wide in Martha Bailey’s garden, New Milford, Connecticut. Photograph © 2004 by David W. Harple, The New-Times. September 2, 1992, Star Beacon, Ashtabula, Ohio. 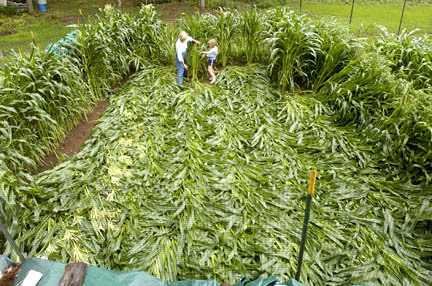 On August 30, in Austinburg, Ohio, a large rectangle was found in a young, sweet corn garden planted by Donald A. Wheeler. The rectangle measured 8-by-25-feet and Mr. Wheeler told me: “In all my gardening years, I have never seen anything like it before. “Carl Feather, reporting for the Ashtabula, Ohio Star Beacon wrote: “It just appeared as if something came down out of the sky, pushed the stalks flat on the ground and left without leaving any other trace in the soft ground.” When I telephoned him, he said local farmers thought the soil was simply too wet and the corn fell down. But Feather, who took photographs, said all the corn stalks were lying generally in one direction, not randomly as might be expected if moisture were responsible. “None of the stalks were broken and none of the ears were taken,” Donald Wheeler said. At first, he suspected deer, but when he checked his field for tracks, he could not find any. Then he thought that maybe a freak storm had hit. But the corn stalks were not twisted, and nothing else nearby showed any signs of storm damage. The crop was young because it was located near Lake Erie where the water can moderate temperatures, allowing a longer growing season for second plantings. Connie Sistek, an investigator in Ashtabula, talked with biophysicist W. C. Levengood about the odd corn formation. He asked her to gather plant and ear samples on September 2 and October 5, 1992, both from inside the downed rectangle and outside for controls, so he could have different growth stages. 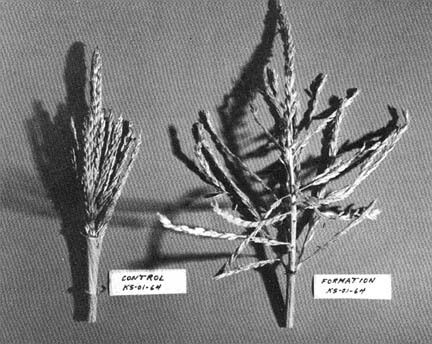 Corn tassel on right has accelerated development, taken from rectangle formation found August 30, 1992, Austinburg, Ohio. On left is normal control corn tassel from outside rectangle which is still closed. Photograph © 1992 by W. C. Levengood. 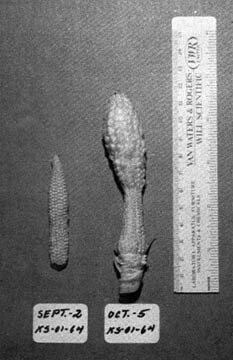 Corn growth at the apex of an ear became more normal four weeks after apparent suppression of embryo growth by unknown energy source that flattened rectangle of corn in Austinburg, Ohio, on August 30, 1992. Photograph © 1992 by W. C. Levengood. To Be Continued in Part 2 about European crop formations and mysterious lights in July 2004.